I am having a problem finding shocks for 1966 GS. AutoZone has some that "return ride quality to classic cars." Monroe makes the front ones but not the rear. Thank you. I am not aware of any shocks made specifically for the GS application. 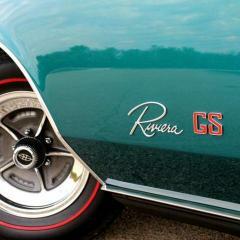 Typically the application is 66-70 Riviera and these are fairly easy to find even though many of the chain stores no longer list them. Common sense tells us the original HD GS shocks were more firm than the standard ones, however; shocks made today (especially gas) are likely to offer as much or more control than the original HD shocks due to technology advancements. They show up on ebay pretty often.